Below are a few samples of rare blank papers in archival sleeves with detailed museum labels. These legendary art papers are no longer made as the historic paper mills were closed, long ago. Supplies are very limited. Samples are 5x7 inch when possible. As paper is fragile no returns allowed. No choice of position in the sheet-watermark is possible. The great paper mills of England have closed & these papers are no longer made. The legendary Hand & Mould Made Papers live on in the fine art. We offer a few sample pieces of rare blank papers for hands on experience for artists, paper collectors & museum reference. Most are sized around 5x7 each. They are in a resealable archival sleeve with detailed museum label listing known details of original sheet: Maker, Size, Weight, Surface, Watermarks, & date made. There may be some toning from age , spots, dents and ruffling of occasional deckles;all part of the character of these great Antique papers.Full watermark only appears on full sheets. Partial watermarks may occur randomly on samples with no choice. Due to the delicate nature of these papers there are no returns allowed. These wonderful rare papers were hand made with cotton and linen rag from 1915 to 1931. 5 x 7 approximately Packaged in individual resealable archival bags each with our detailed museum label. - A great gift for art lovers. Photo From left to right: Mid blue paper watermarked "HAND MADE J WHATMAN 1925 ENGLAND"
Light blue paper is watermarked "HAND MADE J WHATMAN 1915 ENGLAND"
The soft white paper is watermarked "HAND MADE J WHATMAN 1931 ENGLAND"
There may be some toning from age , spots, dents and ruffling of occasional deckles;all part of the character of these great Antique papers. 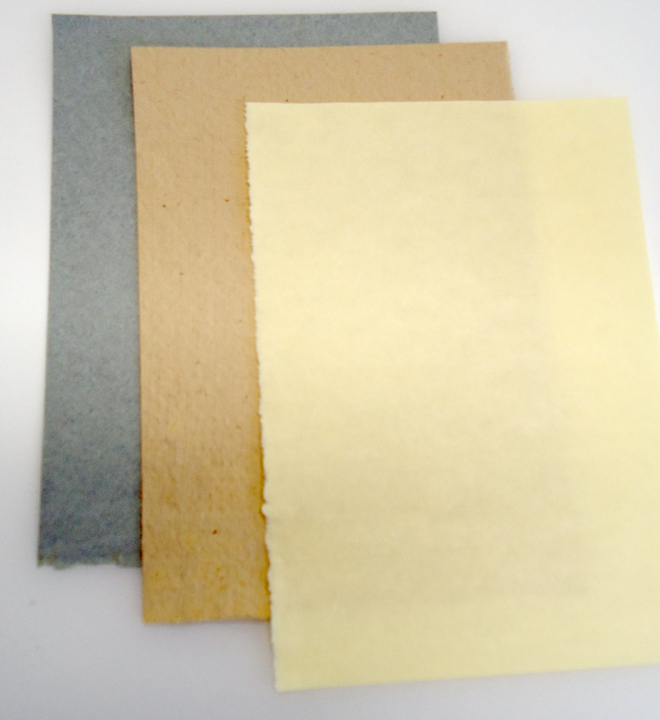 These legendary buff colored papers in all four textures. They range from light buff to mid buff color and are great for creating warm watercolors, especially figurative work. Right photo left to right: Circa 1931 Rough, 1959 Cold & 1959 Hot pressed. Each has a different tone- all sized for watercolour or ink. These rare blank paper samples are all packaged in individual resealable archival bags each with our detailed museum label. As large as possible up to 5 x 7"
Samples may randomly have partial watermarks or deckel edges. 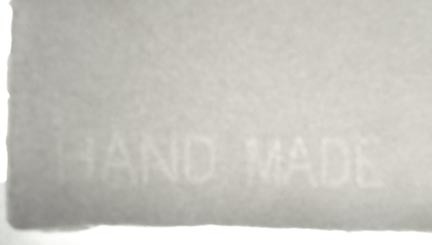 We have only a few samples available of this legendary off white hand made paper. It is cold pressed 210 pound weight. The original size is a double elephant- approximately 28 x 41 inches. Sample is 5 x 7 inches. It's soft cold pressed surface and is sized for watercolour or ink. This rare blank paper sample is 5x7 inches packaged in individual resealable archival bags each with our detailed museum label. The label for the remaining sheets from the quire is shown below. These precious few sheets were originally from Alexander Calder's studio- gifted by him to his studio manager. The original size is a double elephant- approximately 28 x 41 inches. These Vintage papers are no longer made as the mills closed in the early 1980's. These papers were made by artisans for artisans. This is a set of three samples plus one wild card paper of very limited supply. 1976 Turner gray handmade by J B Green, 1973 DeWint hand made by JB Green, ana 1980s Bodleian Butter Yellow mould made for JB Green at the Wookie Hole Mil. All these Antique papers were made in the historic paper mills are now closed. These large samples of rare papers are 5 x 7 inches each approximately. Each is individually packaged in a resealable archival bag with our detailed museum label. There may be some toning from age , spots, dents and ruffling of occasional deckles;all part of the character of these great Antique papers.. 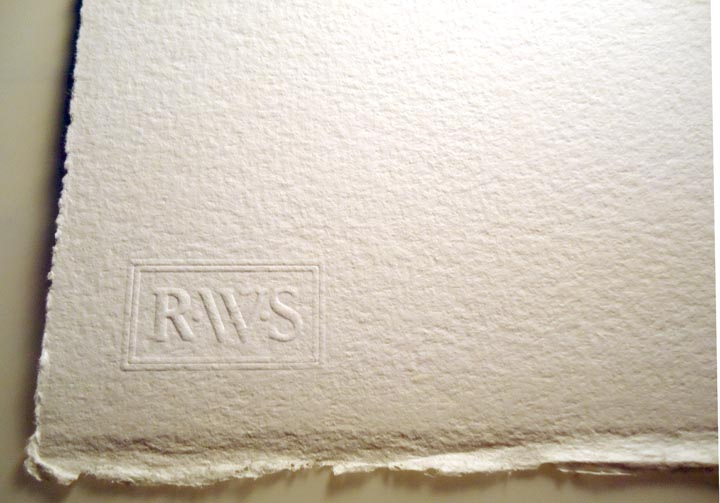 These historic Artisan papers were made in the great British paper mills of the past . More Recently Made Papers of fine Quality. This is considered one of the finest hand made watercolor papers which is still being made in the same mill in Italy. The Fabriano mills were some of the earliest paper makers in Europe and made papers used by DaVinci, Michelangelo and luminaries since then. The C.M. 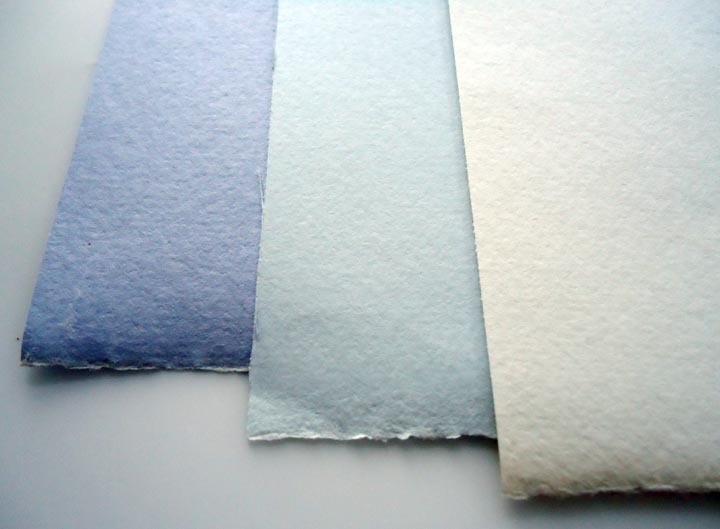 Fabriano Mill only creates this hand-made watercolor paper once a year and are often sold out. 140lb Cold Pressed (not hot pressed)-It has a soft texture and a lovely soft white color. Full sheet is 22 x30 inches (full sheets are unavailable). 140 Lb. Cold Pressed - sized for watercolor. Edges are cut with occasional deckle edge in some sheets. There may be slight variations in the surface from being hand made as well as slight dents and ruffling of edges. This newer RWS paper was created earlier in this century by John Purcell Paper to the high standards of The Royal Watercolour Society, London England. This newer RWS - Not generally available outside England. this sample is a great way to test the paper berfore importing it. We found this paper to be one of the best papers for our watercolors. The surface, sizing and linen content gives it an amazing workability similar to the finest J B Green & Whatman papers of the past. Edges are cut with occasional deckle edge in some sheets. There may be slight variations in the surface, slight dents and ruffling of edges. 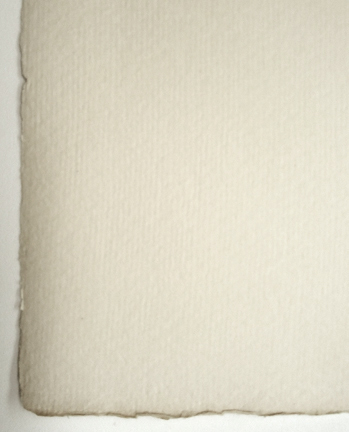 This watercolor paper is has been hand made with cotton and a high linen content. It has one of the highest linen contents of any modern hand made paper we know of. This carries on the legendary tradition of this high quality European watercolor papers. 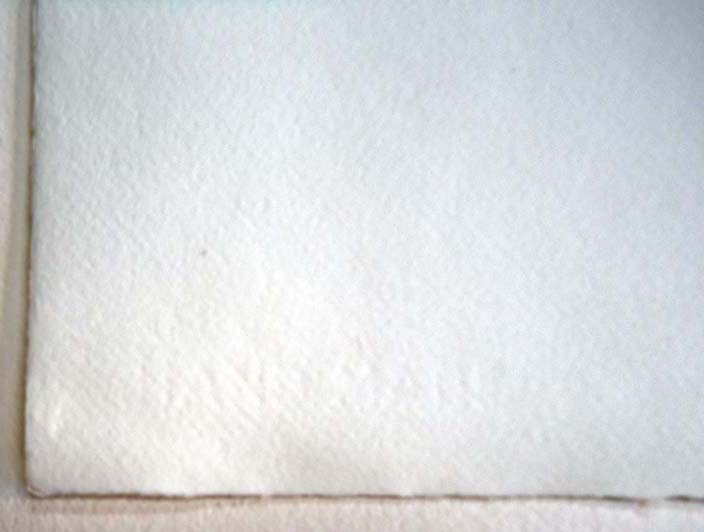 This fine watercolour paper is hand made in the Ruscombe mill in France. More than any mill they have made strides to revive some of the great papers of the past. It is gelatin sized and loft dried. The high linen content gives this paper a strong re -workable surface similar to the finest pre 1940s J B Green & Whatman papers of the past. Colors stay more crisply on the surface on high content linen paper. 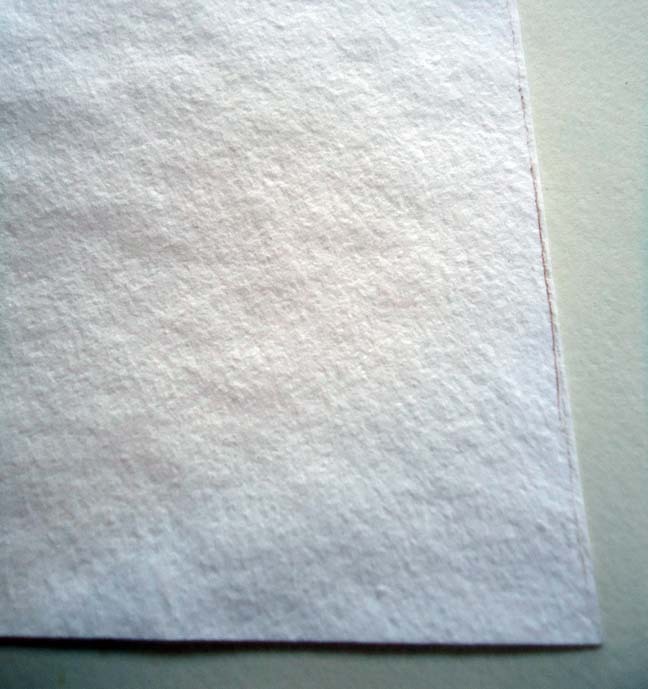 This paper is not generally available in the US -this sample is a great way to test the paper berfore importing it. 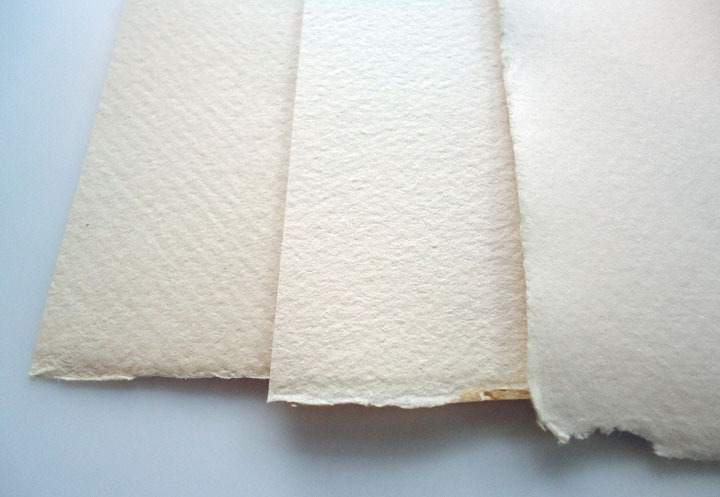 Being high linen content it is a very dynamic paper and should be soaked & fastened down to keep it flat whilst working. It becomes flatter as it dries in the stretching process. "Joshua Cristall" 140 Lb. Cold Pressed - sized for watercolor. Edges are cut with occasional deckle edge in some sheets. There may be slight variations in the surface due to hand making, slight dents and ruffling of edges. (c) -2013 All original designs and photographs shown herein are and copyright protected.